It’s raining…again. On days like today my thoughts turn to comfort and what is more comforting than memories of home and hearth. 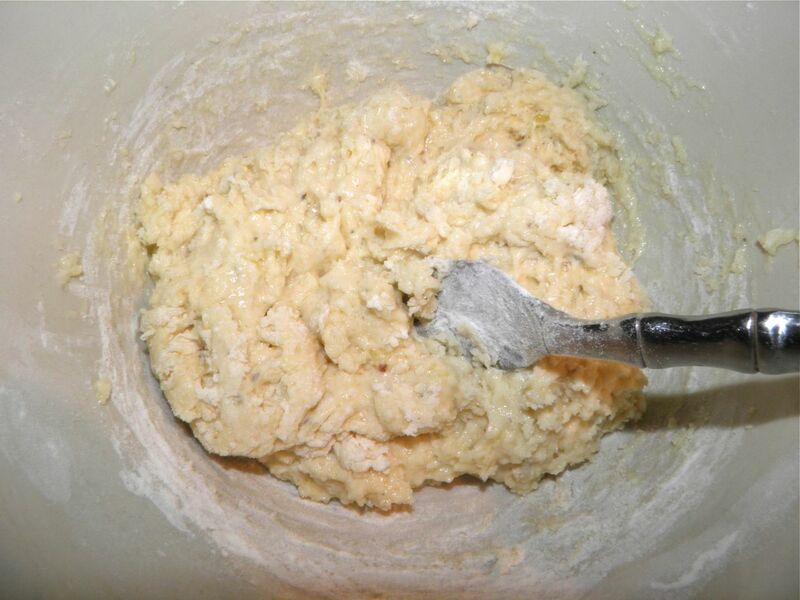 I have to confess right at the start this is MY version of my mother’s recipe. It’s essentially identical except for technique. I’ve done two things to increase the overall flavour without adding additional ingredients. When I was growing up we didn’t have scads of money. Nor do we now. In my mother’s family the situation was magnified. 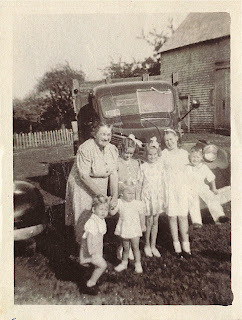 She grew up during the Depression years and, the same as the rest of the world, its impact was direct and felt throughout rural Canada. My mother’s mother had to feed four children plus her husband on what I know was not the greatest of means. 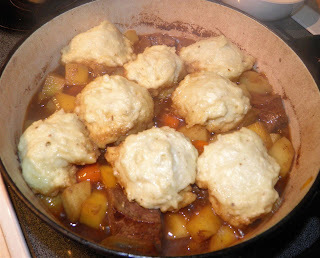 As such, many of the recipes I grew up with were ones that my mother learned at her mother’s knee. To get an idea of rural life in Canada in the 30s think on these facts. My mother had many duties, even at 10 years old or younger. One of them was to get up and start the day’s bread before going to school. I also can remember stories of the hand-me-down clothes of her sister’s, and repairing them to keep them wearable. Once my grandmother made a new coat for my mom when she was in her teens. It was the first new coat she had ever owned. Although my grandfather operated the water driven sawmill on the river, customers at the time weren’t plentiful and the workers still had to be paid. They supplemented their food from the chickens and cows in their barn directly across the dirt road and the orchard behind it. Those animals and trees all had to be tended too. Life back then – which wasn’t that long ago – was substantially different than now. Try to explain that to your kids. Few cars, no internet, no cell phones – hardly any phones at all actually. Families would share them. It was from this time the recipes I grew up with had their origins. Homey. Filling. Healthy. Simple. So what exactly did I do differently to mom’s stew? 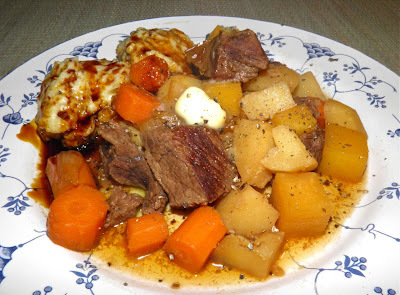 Her version starts the meat and vegetables together in the pot at the same time sort of like a boiled dinner. 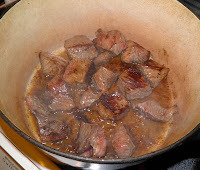 I brown the meat to release some of the flavour, and fry my onions slightly for the same reason. It really makes a difference. There are no herbs or spices in this. They were precious at the time so weren't in the original. Just good old salt and pepper is all you really need. Note the amount of water does not cover the vegetables. See bottom left in the photo. 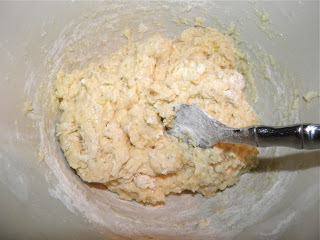 Mix the dumpling ingredients together just before using. Note: Take care in choosing your beef. Often when you purchase “stew beef” in the grocery it is essentially trimmings from all cuts of beef. To make a good stew you need well marbled beef. 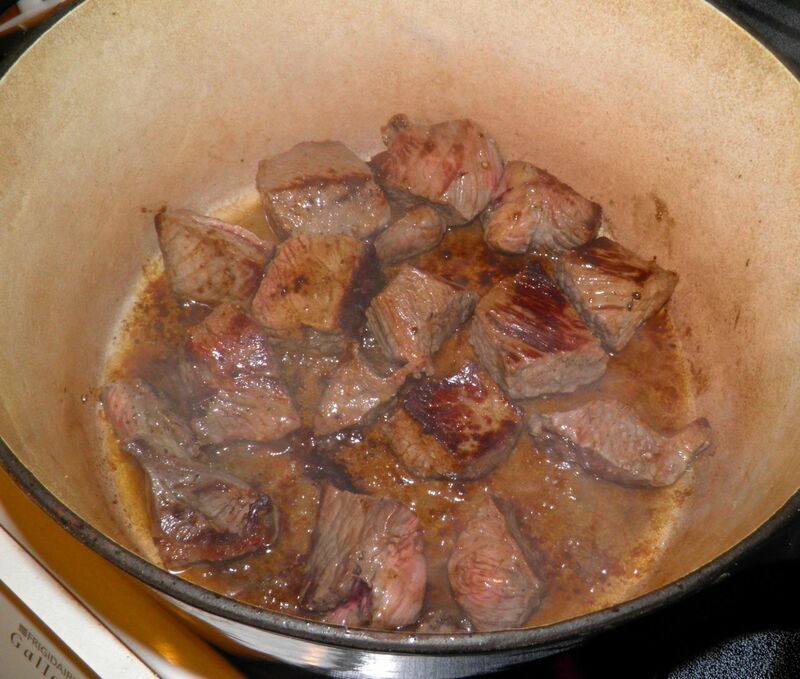 The fat is a necessity to render the cooked beef tender. 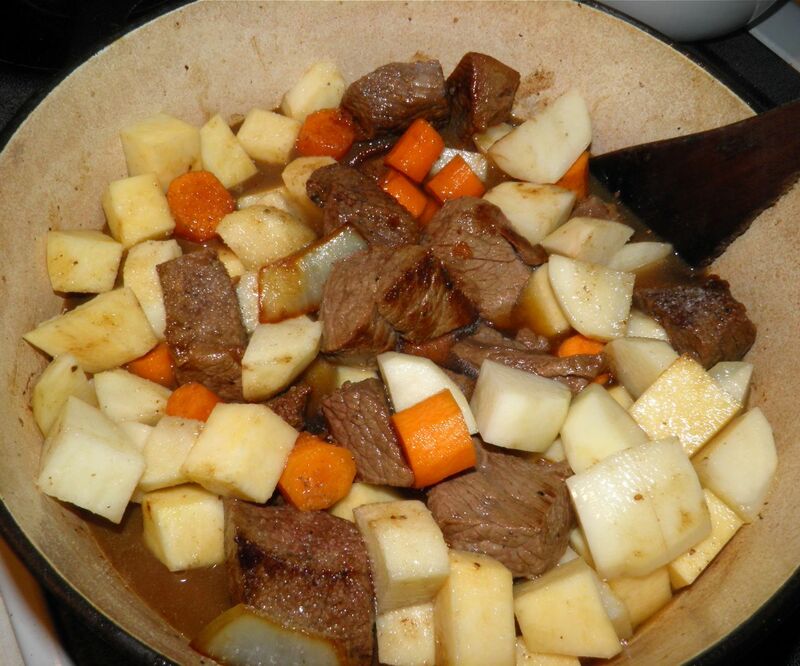 If you buy lean stew beef, your stew meat will be dry. Get a cheap marbled roast and cut it yourself if necessary. It’s worth it. And don’t worry about the fat. It’s better for you than most of the fats in the “healthy” foods you buy. If you like this post rewet it using the link at top right, or share using any of the links below. Docaitta, do you think green onions could be used instead of white? White onions generally don't agree with me. Thanks! I suppose, but it wouldn't be the same. It sounds like you have an allergy to allicin, the ingredient that is found in foods from the lily family. Foods in this family include onions, leeks, garlic, shallots and chives. Allicin is destroyed or at least weakened by cooking. Have you tried sweet onions before? They may have less of the compound.